Tuffy says: Elite Zan Parr is For Sale. Here is a perfect mare. Old foundaton look. She is beautiful, sweet, conformation to spare, pedigree to burn and gray! Oh and she rides! She is a bit sour and would rather be a mom than a rider. She knows how to spin. I think she just burned out. A grand-daughter of ZAN PARR ZAN and going back to TWO EYED JACK on the dams side has made this mare a wonderful asset to our program. It takes mares like this to make the kind of foals we are know for. But I HAVE TO cut back. So many good ones to choose from it is hard to pick! UPDATE: this mare is predisposed to produce foals that have NEONATAL ISOERYTHROLYSIS. Neonatal isoerythrolysis is a disease of newborn horse foals and mule foals that occurs within the first week of life. It is caused when the mare produces antibodies against the foal's red blood cells and transfers those antibodies to the foal through colostrum during the early stages of lactation and nursing. 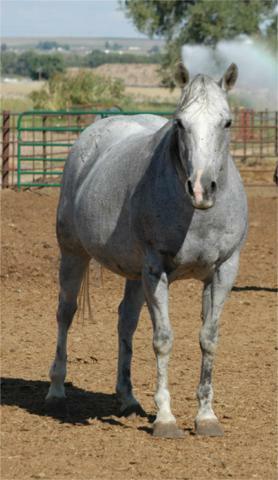 This syndrome may occur when the blood type of the mare is different than that of the stallion and the foal inherits the sensitizing red blood cell type from the stallion. Mares that are negative for red blood cell factors have the potential to develop antibodies against those factors. Mares only become sensitized as a result of exposure to blood of a fetus with incompatible blood type as a result of placentitis, difficult parturition, or from exposure to blood containing the foreign blood factors from a previous blood transfusion. Horses have 8 different blood group systems, each of which has different factors. Some of the factors are more commonly associated with NI (e.g. factors Aa, Qa and Qb). There are several other, but less common, factors (Ua, Ka, Qc, Pa, Pb, Ab) that can also cause NI. However, for unknown reasons, only a small number of mares that are negative for a factor develop these antibodies. Generally, a mare does not develop sufficient amount of antibodies to cause NI in its foal during the first pregnancy from breeding to a stallion that has a factor for which the mare is negative. However, in rare cases a mare may produce sufficient antibody during a first pregnancy and can cause NI in her foal. Increased risk of developing NI occurs with subsequent pregnancies due to breeding to that stallion or another stallion with the same red blood cell factor. After ingestion of colostrum containing antibodies to red cell factors, the antibodies are absorbed into the foal's blood. This is unlike the situation in humans where the antibodies (which most frequently are anti-Rh antibodies) cross the placenta during late pregnancy. The antibodies attach to the factors (antigens) on the foal's red blood cells, and through a series of reactions, cause the foal's red blood cells to rupture (erythrocyte lysis, which describes the syndrome's medical name, neonatal isoerythrolysis). There are two ways to prevent NI. One method is to withhold colostrum from the foal of a mare that has antibodies to red cell factors of her foal. The foal should be muzzled and the mare's milk emptied for 24-48 hours under the advisement of a veterinarian. An alternate source of colostrum should be administered to the foal. The other method is to breed mares only to stallions that have red cell factors that she also has or have red cell factors to which she is unlikely to develop antibodies. SOOOOO, if your willing to do what it takes to give this mare extra time to produce some excellent foals, I have done a major reduction on her price. I just want everyone to be aware that when she foals, the foal may not be able to nurse off of her the first 24 hours and colostrum must be obtained from another mare. After 24 hours, the foal can then nurse normal from her. It is not passed to the foal.